Investing in braces so you can enjoy the benefits of straight teeth is a great idea. However, it’s important to realize that the way you care for your teeth while wearing braces determines how they’ll look when the braces are taken off. While your teeth may be straight, if you didn’t care for them properly while the braces were on, they can end up stained and troubled by cavities. Many people have to change their teeth care habits while they have braces to keep up with maintenance, especially if they don’t have good habits. However, it is worth it. 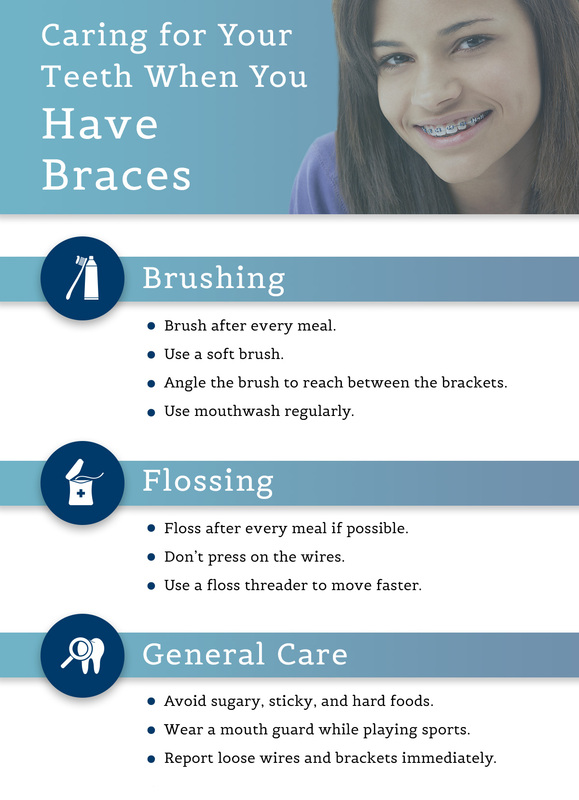 When you get braces with us in Thompson or Augusta, we’ll take the time to teach you how to take care of your specific type of orthodontic device. We want you to feel confident and ready to make the most of your treatment. In today’s blog, we want to go over basic guidelines that are sure to bring you success. Brushing your teeth when you have braces. First of all, how often do you have to brush when you have braces? At a minimum, you should brush twice a day. In an optimal situation, you would brush and likely floss after each meal. Doing so will ensure your mouth stays healthy and keep gum disease and tooth decay at bay. You’re especially vulnerable to these issues while you have braces trapping food particles on your teeth and threatening them bacteria buildup and staining. When you brush, use a soft brush that can reach the smaller corners of your mouth. Brush downward from the top and then angle your brush upward from underneath to dislodge a majority of particles that have become caught between the braces. Again, brushing often will prevent serious buildups that take extra work to clean away. Flossing when you have braces. No matter how well you brush, you will still have a bunch of particles trapped between your teeth. Flossing becomes extra important when you get braces, which can be annoying for some people because it takes a bit longer. However, the more you do it, the faster you’ll get. You can also use a floss threader to make sure the process goes quickly. Though flossing can take an extra few minutes, it will protect your teeth from decay and ensure you have a blazing smile when the braces come off. 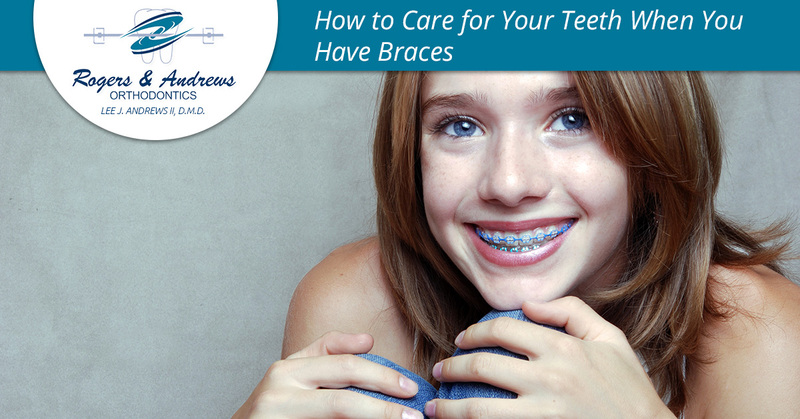 Caring for the braces themselves. If you have braces, chances are good you’ll have brackets on all your teeth. That’s about 32 brackets collecting food and possibly acting as shelters for bacteria. Without following the advice we shared above, you can end up with decay or demineralization. Avoid sugary, sticky, and hard foods like apples, chips, hard candy, carrots, popcorn, gum, and corn on the cob. While avoiding foods you like and putting time into brushing and flossing might not be a party, doing so ensures your braces can do their job as quickly and effectively as possible and without complications. At Rogers & Andrews Orthodontics, we are dedicated to helping our patients achieve their dental health goals for years to come. Orthodontics have the power to set you up for a lifetime of healthy, functional teeth, and there is nothing we love more than making this possible for people in Thompson and Augusta. We encourage you to contact our orthodontics offices and learn more about our cutting-edge techniques, payment plans, and welcoming atmosphere. We’re here to act as your strongest encouragers as we help you leave any and all of your dental issues behind.